This week, instead of discussing a new board, I thought it would be interesting to talk a little bit about changes to our nerdy routine since moving across the country. Moving back to Ontario has been a big change. While we have more family and friends here, life has become a little less familiar and a little more complicated. One change that seems to be taking a little longer than expected to adjust to has been finding ways to keep up our nerdy routine. About once a month (sometimes a little more), Cody and I would complete what we referred to as The Sunday Circuit. We would head into downtown Victoria and checkout all the nerdy stores. We would check out the latest in comic books, model paints, miniatures, and board games at places like Curious Comics, Legends, Yellow Jacket, the Games Workshop, and Triple Play Sports, comparing prices, picking out new things, and eyeing up expensive toys and games that we couldn't justify dropping all the money on (E.g. Mansions of Madness). Then, when we were done that, we would head across the street to Cherry Bomb Toys. Cody would browse the toys from his childhood, and I would play pinball on an old Spider-man pinball machine that they kept in the back. Cody would actually stockpile a couple extra quarters in his pocket just for this occasion, likely because the longer I was playing the more he could look around. Then right before going, we would play a final game of pinball together, then head home to enjoy are finds. This was our Sunday Circuit, more or less. Some days we would add a couple of thrift stores (if Cody was looking to score some new TCGs or Ninja Turtles). Other days we would combine shopping with a couple of games at Interactivity - the board game cafe. No matter what stops we made, we always had a great time and often came home with at least a couple new additions to one or more of our collections. But as I said earlier, things have changed. A new town, a new Sunday Circuit. While Barrie is a great town and there is a lot of appeal, things just haven't been the same here. There are some great local stores that we have enjoyed exploring - there is a comic book store near the house, a board game popup store that is closing soon (some good deals to be had), and a board game store that offers quite a selection. These are great, but it is just so different. The atmosphere has changed, the weather has changed, and what was a walking circuit filled with ocean and mountain views, has become a driving circuit filled with heavy traffic, snow, and flatness. Yes, I am whining a little bit, but this weekend I found a glimmer of hope. This weekend we went to a new store, and it got my board game butterflies flying! For Cody's birthday we took a trip to Vaughan to visit a massive board game store/warehouse and it was spectacular. 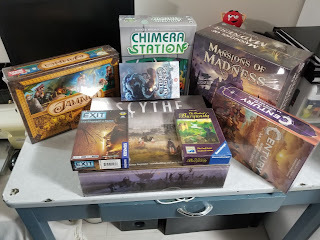 The prices were good enough that we bought a couple of things we probably shouldn't have (check out the picture), we even finally splurged and bought Mansions of Madness (yet to play but man does it look good). While we likely won't be making the trip down there every month - apparently our paychecks are meant to pay bills and rent, it was great to get excited again. All in all, it feels great to feel that familiar feeling again, as we adjust to life (and gaming) in a new city. We would love to hear about some of the local haunts in your town. Some of the gems off the beaten path, some hole in the walls that offer great deals, or just your favourite board game store or comic shop. Want to win? Like us on Facebook, Follow us on twitter, subscribe to our blog, or comment on a blog post for an chance to win. Really like free stuff? The more you share, click, or comment the more you will be entered to win. Contest will close February 15th.